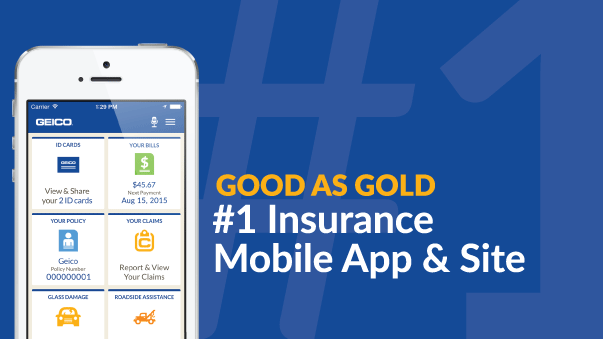 Keynote - a global leader in cloud-based testing, monitoring and analytics for mobile and web - recently gave the GEICO App a number one ranking in their 2015 Mobile Insurance Scorecard. The Scorecard reviewed approximately 100 criteria across mobile web and mobile app channels and awarded GEICO the highest overall score in all four performance categories among a who's who of top insurance companies. Consumers continue to do more business via mobile channels and have high expectations when it comes to using mobile apps. Rest assured, GEICO is committed to constant improvement of its mobile app experience that helps save more than just time and money. Check out your GEICO App today to see what's new! Paying your bill is now easier than ever. "Swipe Pay is going to allow our customers to use a single swipe action to pay their current bill," says Liz Reynolds of GEICO Mobile. Policyholders who aren't on recurring payment plans can now use this feature to pay their bills via credit card in seconds. Tracking insurance claims is now a breeze. If you've been in a collision with a GEICO policyholder, you can use the new claims tracking feature to receive updates from claims adjusters and get notifications from body shops. Does your family have a policy that covers multiple vehicles? If so, GEICO's mobile app is now easier to navigate. Each driver can customize their mobile experience so they only see the information for the vehicle they're assigned to. "You're not going to be cluttered with too much stuff," says Reynolds. "You're going to have more of a personalized experience just for you." Have you downloaded the GEICO app yet? Get it for free in the App Store or Google Play.